From the Old Town Square the coronation procession continued along Charles Street towards Charles Bridge across which it moved to the Lesser Town. Before it reached Charles Street it moved across the Little Square which is located between the Old Town Square and Charles Street. 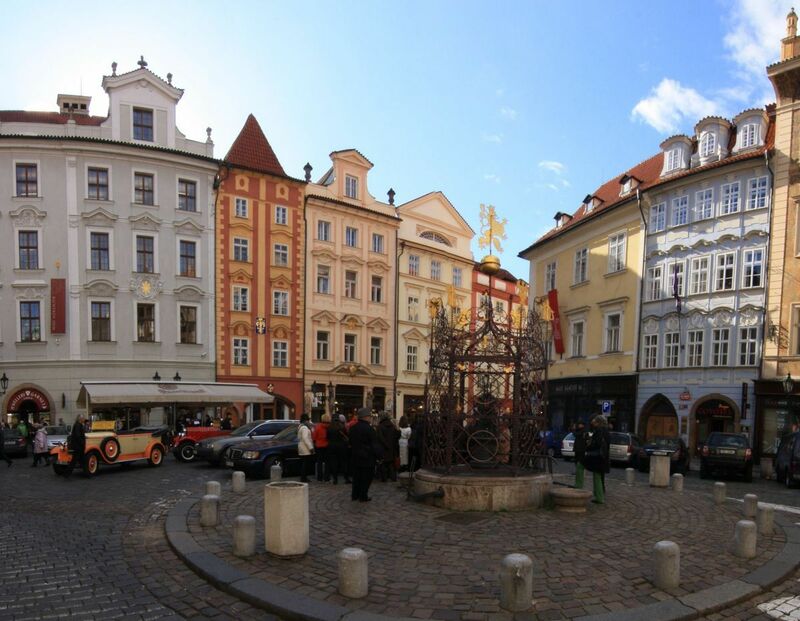 The square with triangular layout is surrounded by gorgeous Renaissance houses. The square used to be a center of French merchants in medieval times. They also had their burial ground here. 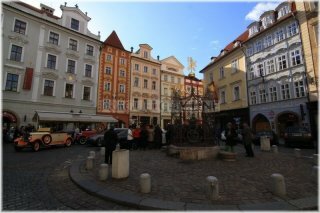 The square was originally called Ryneček (Little Market Square), later the Malý ryneček (Small Little Market Square) and in 1850´s it got the name Malé náměstí (Little Square). However, there was a high concentartion of pharmacies here therefore the square was very popular. Just next to the Renaissance house U Bílého lva (At the White Lion) you have the opportunity to see the corner house U Zlatého rohu (At the Golden Corner). 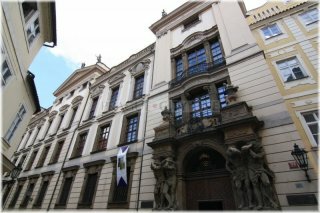 There is an extensive Richterův dům (Richter´s House) on its right side where the first Prague pharmacy was opened around 1400. And in 1882 the first Prague telephone central office was established right in this house. The tourists will be charmed by the neighbouring narrow house with red facade. It is the house U Zlaté lilie (At the Golden Lily), neighbouring on the houses U Zlatého orla (At the Golden Eagle), U Černého koníčka (At the Black Horse) and on the corner house U Zlaté koruny (At the Golden Crown). The third side is formed by some more remarkable buildings. One of them is the house U Bílého lva (At the White Lion) where the first Prague printing office used to be. Yet the most important building is Rottův dům (Rott´s House). The house of the Prague ironmonger Rott was built in 1890 and especially its facade is unique. It is decorated by splendid ornaments representing various crafts and farm works. The ornaments were created according to the cardboards of the famous artist Mikoláš Aleš. There is a fully functional fountain with iron grille in the centre of the square from 1560. Do not forget to take a look at the little angels and the lion at its top. From the Little Square the procession passed through Charles Street, the link with Křížovnické Square. 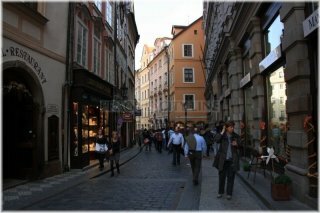 The street was originally called Svatoklimentská, later the name was changed to Zlatnická (Goldsmith), Ševcovská (Shoemaker) and also Nožířská (Cutler). The street has been here since 12th century already. Many significant historical landmarks were located there and we will discover them right now. First, the royal procession was passing along the house U Tří granátových jablek (At the Three Pomegrenates), further along the house U Tří andělů (At the Three Angels) and the house U Hejnů. The opposite houses are U Zlaté hrušky (At the Golden Pear), U Zlatých hodin (At the Golden Clock) and U Zlatého jablka (At the Golden Apple). There is another very significant landmark standing not far from these buildings. The Clam-Gallas Palace is ranked among the most remarkable palace buildings of Prague. The palace used to be among important Prague cultural centres in the past. Besides the concerts also theatre performances used to take place here. Many famous personalities such as Wolfgang Amadeus Mozart or Ludwig van Beethoven had performed here, too. Another significant building is the house U Zlaté ovce (At the Golden Sheep), then the opposite houses U zlaté slámy (At the Golden Straw) and U černého hada (At the Black Serpent). Another houses with beautiful facades are the house U bílého koníka (At the White Horse) and U Zlaté studně (At the Golden Well) at the corner. 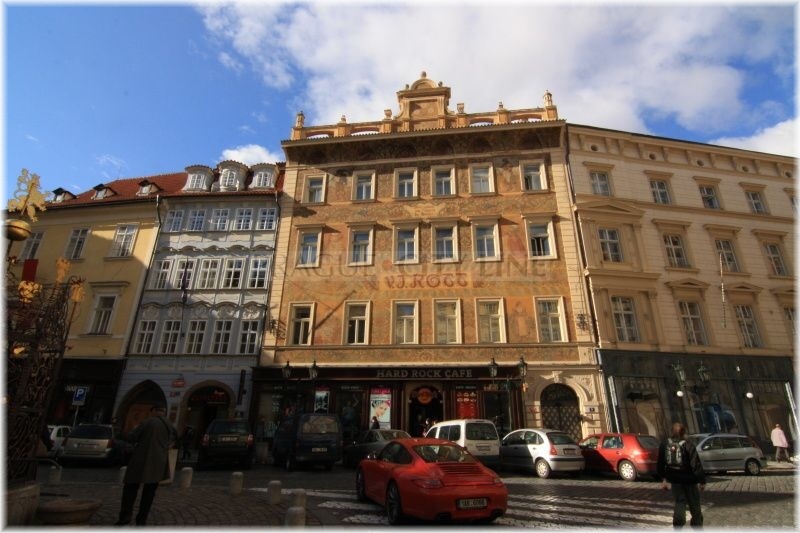 This house ranks among the richest and most beautiful houses of the Old Town in Prague. Many tourists have been enchanted by its splendid Baroque facade with the stucco decorations of the saints. 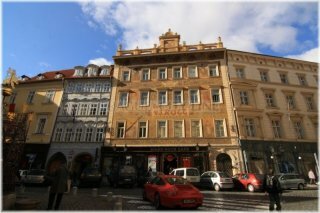 Another significant building is the corner house U Modré štiky (At the Blue Pike) where the first biograph in Prague was opened . 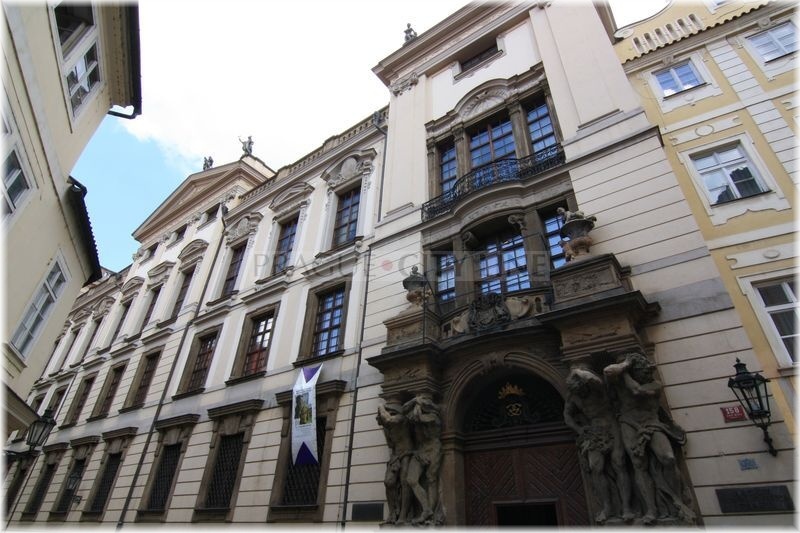 However, the largest area is occupied by the building of the Prague Clementinum which was built in 1556 as a college of the Jesuit university. Many remarkable architects, painters and sculptors were concerned in the construction. An extensive complex involved the assemblies, schoolrooms, accomodation facilities, an observatory and further the neighbouring churches, too. 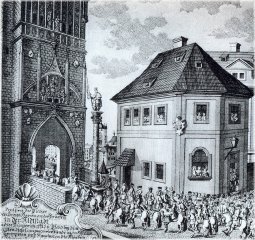 The Jesuits were outlawed in 1618 and several years later the library from the Charles College was moved to Clementinum. The building became the site of the Museum of Mathematics in 1751. There was also a very important astronomical observatory here, founded in 1722. Among the most significant parts of the Clementinum especially the Clock Tower and Astronomical Tower are ranked. The Astronomical Tower is sixty-eight meters high. The bulbous dome at its top is occupied by the statue of Atlant holding a globe. Inside the tower the meteorological observatory has been working non-stop since 1775 measuring and recording the climatic changes in Prague. 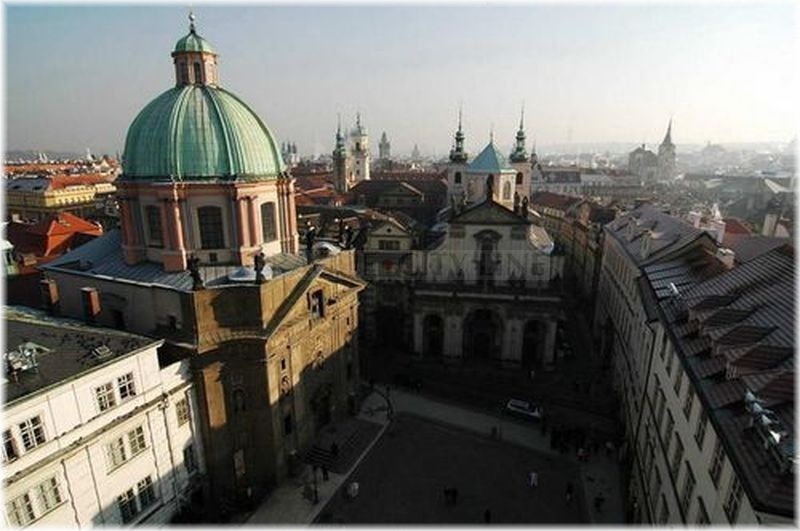 Because the measurements have been performed for two hundred years the Prague Clementinum got many world primacies. 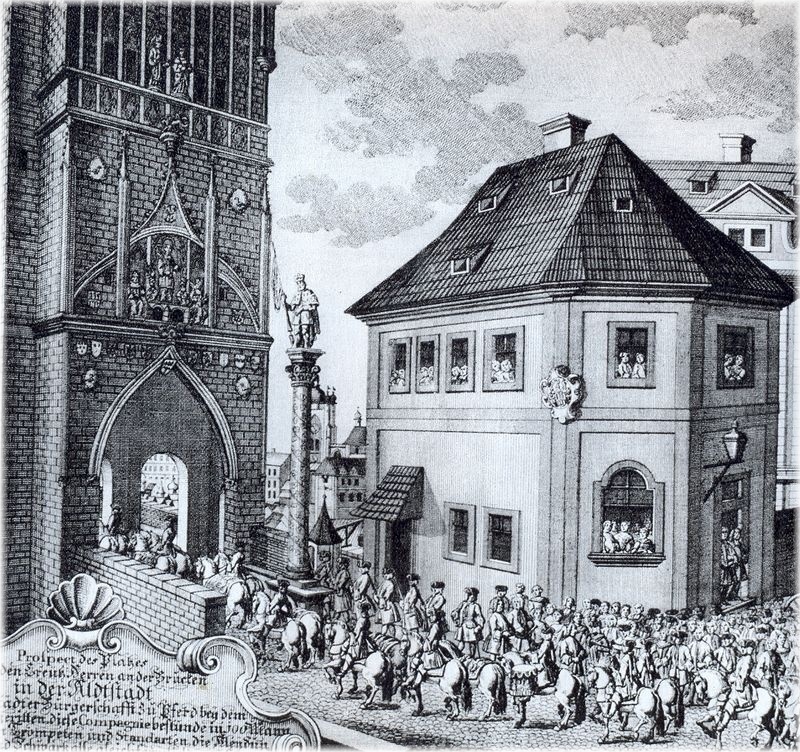 Due to the astronomical observations astronomical devices were installed in the tower in 1750. There are even more treasures hidden behind the walls of the Clementinum, for instance the collection of historical globes in the Mathematical Hall, the Mirror Chapel or the Baroque Library Hall. Furthermore, thirteen sundials are placed here. Currently the National Library of the Czech Republic with its many significant uniques resides here. The Clementinum complex also involves the sacral monuments. The church of St. Clement used to be one of the tabernacles of the Jesuit college. The church was built between 1711-1715. In the interior of the church you can admire exceptional sculptural decoration by Matyáš Bernard Braun. The church is also known for its perfect acoustics so the services and concerts turn into unforgettable experience. The church of St. Clement and Vlašská kaple Nanebevzetí Panny Marie (Italian Chapel of the Assumption of Our Lady) which was built in Renaissance style in 1590 share the same entrance. It is an oval construction from the workshop of the Italian architects. The chapel hides gorgeous Baroque decorations in its interior. You can view a splendid picture of the Assumption of Our Lady on the main altar. 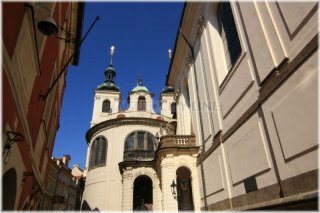 Yet the most remarkable building which creates part of Křížovnické square is the church of St. Saviour at the street corner. This three-aisled church was built between 1578 – 1581. It used to be the main Czech Jesuit church in the past. The visitors will be enchanted by the splendid sculptoral decorations on the church facade from the workshop of the sculptor Bendl. This artist has also performed the rich sculptural decoration of the interior. 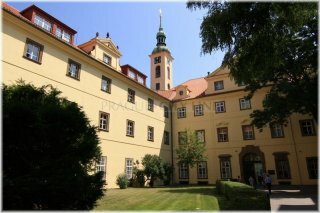 In 2004 the first academical pharish of Bohemia was established here. At the opposite side of the Clementinum you have the opportunity to spot some more remarkable houses. The house U Zlatého hada (At the Golden Snake) where once the first Prague coffee house used to be. There are more significant buildings here – the house U Kamenné mořské panny (At the Stone Maremaid), Schönfeldský dům (Schönfeld House), the former printing office and publishing where the famous c.k. pražské poštovské noviny (Imperial and Royal Prague Post Office News) used to be published. Pöttingovský palác (Pötting Palace), Colloredo-Mansfeldský palác (Colloredo-Mansfeld Palace) and especially the house U Francouzské koruny (At the French Crown) are important, too. The last-named house used to be the residence of the remarkable astronom Johannes Kepler. Our next steps will take us to the second oldest bridge of the Czech Republic. 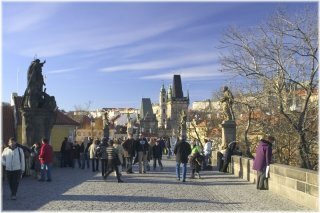 Charles Bridge was built in 1357 in place of the former Judith Bridge which had collapsed in a flood. 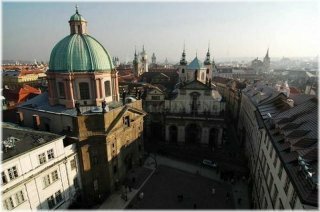 The construction was initiated by the king Charles IV who encharged the renowned architect Petr Parléř. 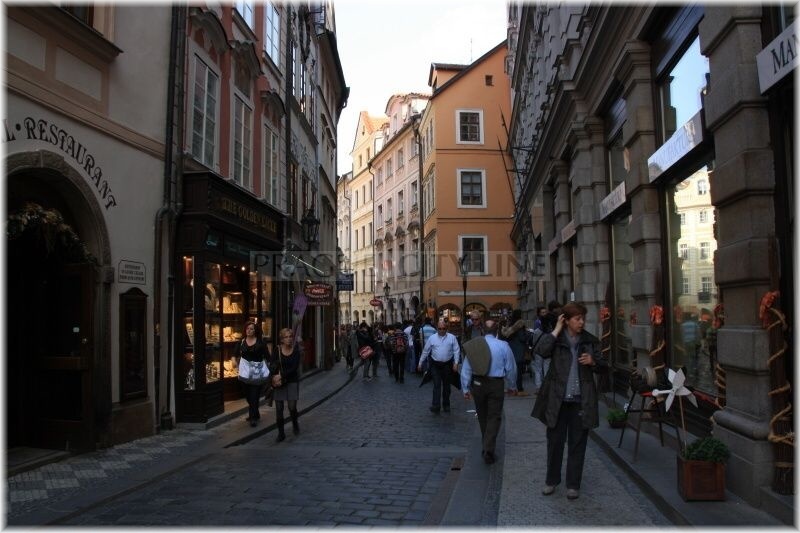 The nearly five hundred and twenty meters long construction is a link between the Old Town and the Lesser Town. It is formed by sixteen monumental arches and its both sides are lined by thirty Baroque statues and groups of statues. There are towers on its both ends, the Lesser Town Bridge Tower and the Old Town Bridge Tower, which open it to traffic. There were big floods in 1784 and 1890 which brought a great amount of alluvia and damaged the bridge. The finishing works related to the consequences of the floods were only completed in 1892. Although the bridge was determined for transport of traffic violations in the past it has been identified only for pedestrians since 1965. The procession continued from the Old Town Square towards the Little Square where the new monarch was already awaited by the representatives of the tradesmen and the clerical dignitaries who wanted to greet the new king. Then the whole procession passed along Karlova ulice (Charles Street) and reached Křížovnické náměstí (Křižovnické square) from where it continued over the river across the Charles Bridge and further uphill towards the Prague Castle for the festive ceremony.